Thousands of Israeli Jewish hardliners gathered at the Western Wall imploring God to throw a wrench in a peace plan proposed by US Secretary of State John Kerry, which would see a Palestinian capital in Jerusalem and other territorial compromises. 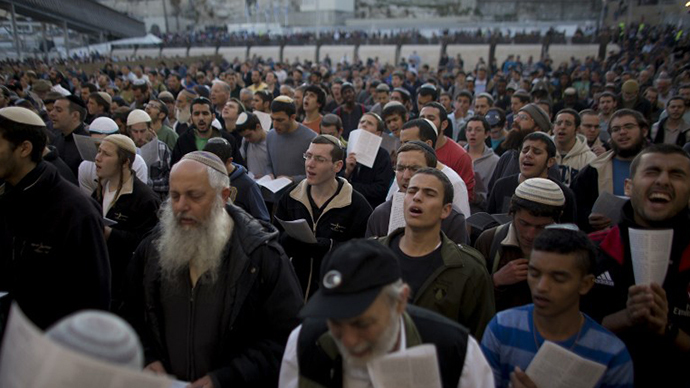 Police say around 2,000 people attended the gathering in Jerusalem’s Old City, where participants called on God to strike fear in the hearts of those who might cause harm to the land of Israel. Housing Minister Uri Ariel and other members of the far-right Jewish Home party, which forms part of Prime Minister Benjamin Netanyahu's coalition but fiercely opposes a two-state solution, were in attendance. In a not-so-veiled reference to Kerry’s role in peace negotiations, Ariel said "thousands of people came to pray for the people of Israel, to strengthen the government and the one who stands at its head, that he may be able to stand firm against the different pressures coming from the other side of the ocean," Israeli National News reported. Since initiating the latest round of talks in July, Kerry has been working to push Israelis and Palestinians toward a framework agreement in the run-up to an agreed April deadline. Kerry, who is set to visit Israel for the 11th time in under a year, has enraged hardliner Israelis with a peace plan that reportedly includes an Israeli withdrawal from the West Bank and a future Palestinian state with East Jerusalem as its capital. Although certain settlements will not be included in the withdrawal, Palestinians will be compensated with Israeli territory. Moshe Cohen, of the Beit El settlement, who was one of the Western Wall event's organizers, told AFP: "Kerry's plan endangers us since he wants to separate between the Jewish people and the Land of Israel." Discomfort over Kerry’s plan and the alleged influence he is yielding over Netanyahu has led some in the Israeli government to accuse Kerry of anti-Semitism. Knesset member Motti Yogev from the right-wing Bayit Yehudi Party told Israeli Radio that Kerry’s “anti-Israeli roots” preclude him from being a fair mediator. 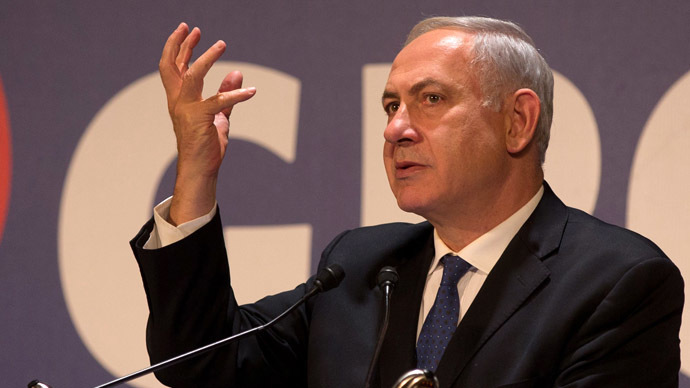 "Prime Minister Binyamin Netanyahu is acting under Kerry's obsessive pressure, which may have anti-Semitic undertones," Israeli media report him as saying. "Kerry is not here to reach a compromise. 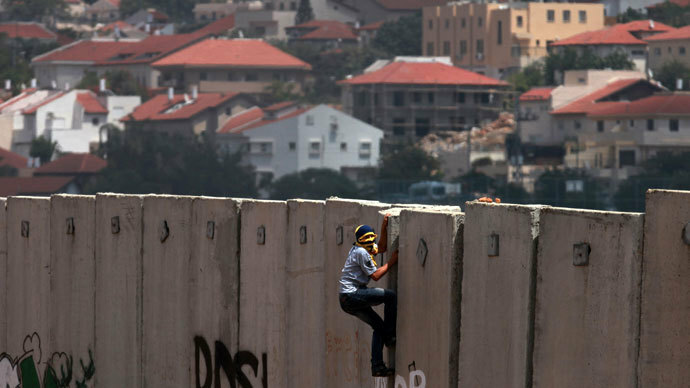 He wants to decrease the Jewish presence in the Land of Israel and create a Palestinian state." Yogev said most senior officials from Netanyahu’s center-right Likud party agree with him. The deputy, who himself lives in a West Bank settlement, also said Kerry once ate hummus with Syrian President Bashar Assad and had previously called him a good friend. 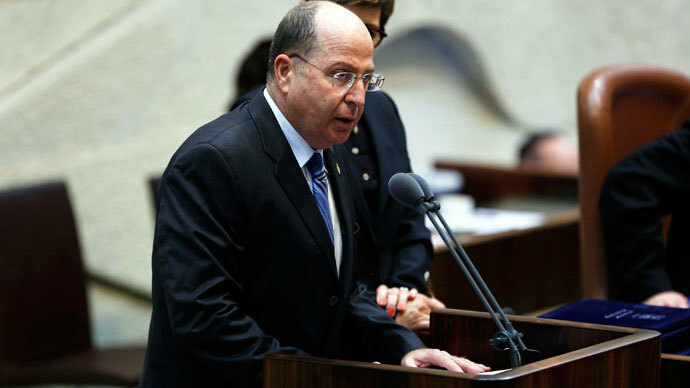 Earlier this month, Israeli Defense Minister Moshe Yaalon was forced to apologize after calling Kerry drive for peace as "messianic" and "obsessive." "The only thing that can save us is if Kerry wins the Nobel Prize and leaves us alone," he said. 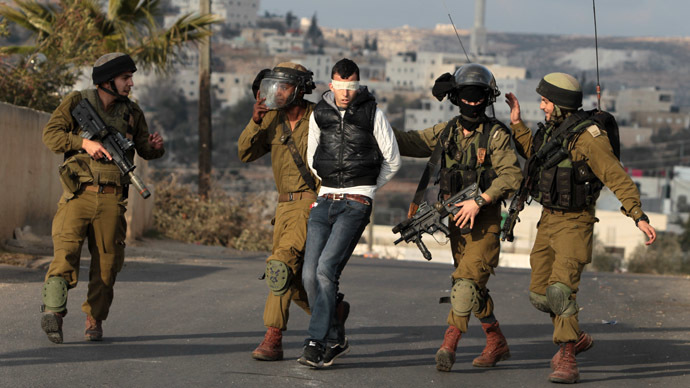 Meanwhile, Netanyahu sparked a crisis in his governing coalition Sunday by saying that Jews currently living in the West Bank would live under the auspices of the Palestinian Authority (PA). US and Israeli officials in close contact with Netanyahu “describe him as torn,” writes New York Times journalist Thomas Friedman, whose reports on a phased Israeli withdrawal from the West Bank based on the 1949 lines have sparked much of the recent uproar. Friedman, who is viewed as being exceptionally close to the Obama administration, said Kerry has been “fanatically relentless” but also “highly sophisticated” in his attempts to bring both sides together.